If you hate overly-long boring meetings that waste your time then maybe the stand-up or standing meeting is the solution you have been looking for. This type of meeting is organised on a daily, or weekly basis, to share the status of projects and individual capacity within the team. Meeting participants share core points and are encouraged to avoid long-winded discussions. The standing approach tends to keep every participant engaged and focused. When a speaker talks too long the body language of the other participants starts to shift, and even the most oblivious windbag starts to notice people squirming when everyone is standing. The meeting is generally held at the same place and time at the beginning of each day, or week. Each team member is encouraged or invited to attend the meeting, however the meetings will not be delayed even if there are some absentees. The key goal of stand-up meetings is to identify challenges before they develop into serious issues, and encourage follow-up discussion to help resolve them. What has been completed since the previous day’s standing meeting? What needs to be achieved today? What capacity challenges need to be addressed? A “Traffic-light” approach is recommended to reduce “waffling” and oversharing. 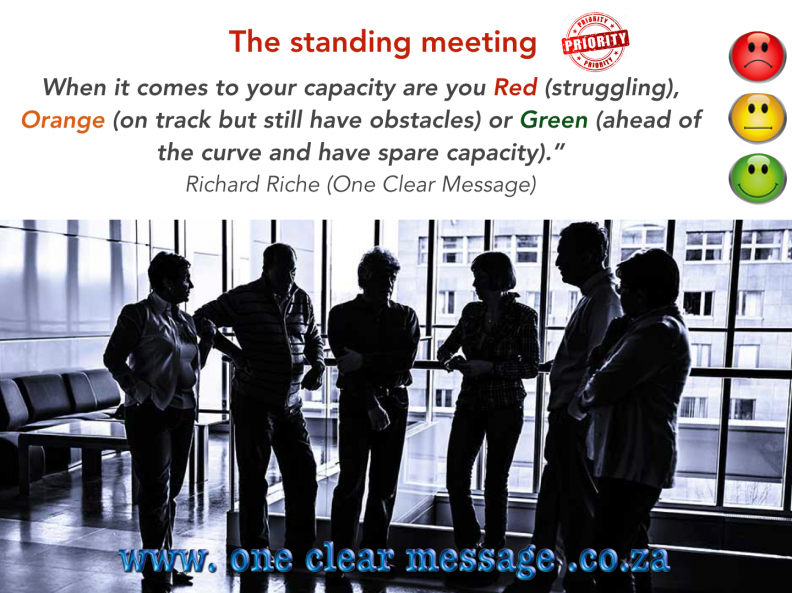 When it comes to your capacity are you Red (struggling), Orange (on track but still have obstacles) or Green (ahead of the curve and have spare capacity). Standing meetings help productivity as they cut the fat out of long meetings, where no one really pays attention and everyone is drawn away from their real work. In addition to status reports teams identify priorities and challenges at the beginning of the work day so that they can, as a team, remove any blockages and make sure projects are on track. Standing meetings are really helpful when deadlines are looming. Not every project runs smoothly and with specialisation in the workplace it is important to check how far along projects actually are and identify potential obstacles early. It also helps to identify capacity in team members to help with these blockages. 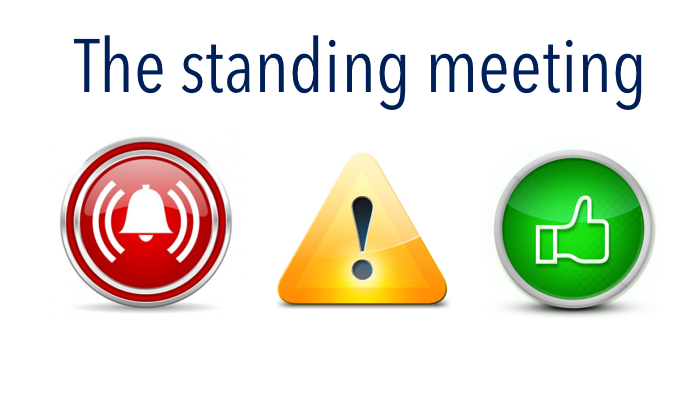 The standing meeting also helps us to set the correct priorities as the team can see what needs to be done, and by when. This helps team members see how their contribution helps the team as a whole succeed. An advantages of being part of a small organisation is that we know what each team member is doing and why. As the organisation grows we often lose sight of how our work contributes to the whole and the level of urgency to get things done to enable us to succeed as a team. Standup meetings quickly reveal just how much work each person has. Managers can get a snapshot of what each member is working on and assign new tasks or support teams members with existing tasks accordingly. Tasks that are identified to be perpetually “in progress” can help us identify blockages to an effective time and process flow. It sometimes becomes clear that certain work is held up due to process or communication inefficiencies. The manager or colleagues can then work with the team member to unpack the depth of the task. Some tasks require more than one person to complete effectively or to be broken down into smaller steps. Similar to teamwork in sports, at work if any team member is not aligned with the strategic goals or pulling their weight, the rest of the team may suffer for it. It is important to watch for members of the team who don’t seem to pay attention when others are speaking, or always give vague updates about what they’re working on. It may mean they are disengaged or they may not fully understand the context, end goal, or impact of what they’re working on. Make time for a one-on-one coaching meeting to address the challenges directly.